The Sad Accounts of the death of General Ross has Just reached Me— I had written him a few Minutes before by the boats in Bear Creek with a Bird’s Eye View of the fortifications of Baltimore and the New entrenchments I saw them throwing up to the NNE.—of the Town, upon Which a Good Many people are Engaged— It Struck Me that this entrenched Camp may be turned. It is proper for me to Mention to You, that a System of Retaliation was to be proceeded Upon—in Consequence of the Barbarities Committed in Canada—and that if Genl. 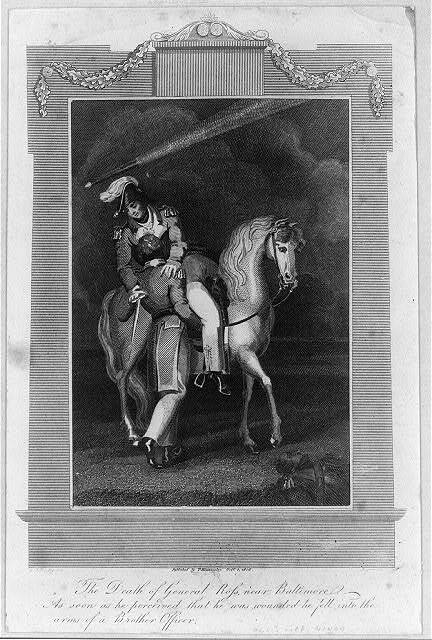 Ross had Seen the Second letter from Sir George Prevost—he would have destroyed Washington and George Town— Their Nature are perfectly known to Rear Admiral Cockburn and I believe Mr. Evans— In them a kind of Latitude is given for raising Contribution instead of destruction but in this public property Cannot be Compromised. The transcript of this letter is re-posted from the Jefferson Patterson Park & Museum and Blog of 1812.